Previous LED TVs from Panasonic may have looked fine in a dark room, but they suffered from rampant conservatism when it came to design. How things have changed. 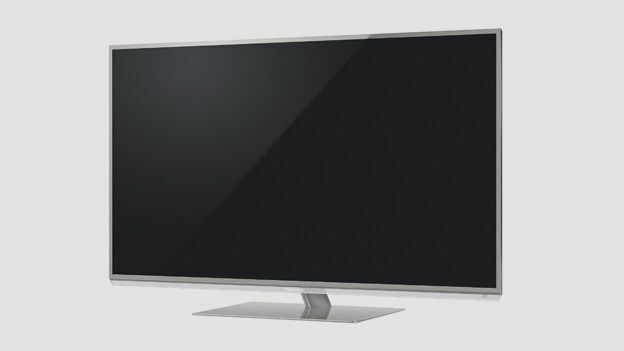 The trim silver lines of the Panasonic TX-L42DT50 have magnetic appeal. The TV, also available with 47- and 55-inch screens (TX-L47DT50 and TX-L55DT50 respectively), does not hide its IPS Alpha light under a bushel. If you're looking for an internet connected screen with generous streaming services, the TX-L42DT50 won't disappoint. Just click the blue screen to see how deep the Panasonic's IPTV rabbit hole goes. There's a wide selection of catch-up and gratis streaming services, including BBC iPlayer, YouTube, Netflix, Dailymotion and Fetch TV, not to mention a variety of European news feeds. You can also step through to a dedicated apps store for extra diversions, including some decent causal games. The set will also Skype, with the help of an optional Skype-cam. The TV boasts excellent multimedia file playback, both from USB thumbdrive, SD card and across a network. All of our test files played, including MKV and FLAC, with MP3s benefiting from a graphical flourish when album art was available. The TV will also timeshift programmes to an external HDD, direct from the EPG, a handy supplement to regular PVRing. With an ultra-thin bezel, chassis depth of just 27mm and angled neck, the DT50 nails the modernistic flatscreen look so beloved of today's style-savvy buyers. The brand has made a massive leap in product design over the past 12 months. This TV may be wafer-thin, but there's no compromise on connectivity. The screen sports four HDMI inputs, SCART and component, PC, a trio of USBs, SD card slot, Ethernet LAN and optical digital audio – and of course, Wi-Fi is built-in. There's plenty to like about the DT50's high def performance. Images are crisp, colours vibrant and black levels punchy. For the best motion resolution, ensure the set's IFC (Intelligent Frame Creation) mode is on, but restrict it to its minimum setting. This will ensure you get a full 1080 lines of motion clarity, without having to endure smudgy motion artefacts. The IPS Alpha panel offers a 178 degree viewing angle, but off-axis vertical viewing is poor – so don't mount the TV high up on a wall. The TX-L42DT50's Active Shutter 3D performance is entertaining, although the required RF glasses (the new cross-brand universal standard for Active Shutter 3D) are an optional (and expensive) extra. Crosstalk is refreshingly low and brightness high. The set's audio performance is solid, thanks to a 10w woofer adding moral support to the set's stereo speakers. For greater ambiance, V-Audio ProSurround 2.1 processing widens the sound stage. It's not surround, but equally it's not bad. While the Panasonic TX-L42DT50 may lack the higher contrast and panel refresh speed of its more expensive WT50 stablemate, you'll not notice any deficiencies when you settle back with your popcorn. This slick-looking LED is quite the prize, both in terms of its 2D/3D performance and net-connected smarts. Expect to have to shop around to find it for a decent price though. The stylish set is a thoroughbred performer, offering superior 3D image quality and killer connected features.